A Nov. 17 reception honoring Bishop Jimmy Nunn also provided a chance for him to learn more about Neighborhood Services Organization, a national United Methodist mission agency in Oklahoma City that began almost 100 years ago. “Serving people with compassion and dignity, NSO is making a significant impact,” the bishop said. He described the mission as “acting on a vision that empowers people to live more fulfilling lives. Empowering people goes beyond providing for immediate needs.” Housing solutions, life skills programs, and a variety of health care services are among the ways NSO assists disadvantaged people. Your church’s Apportionment helps NSO financially. Reception photo: from left are internationally acclaimed acoustic musician Kyle Dillingham, who is an OCU graduate; NSO President Stacey Ninness; and Bishop Nunn. 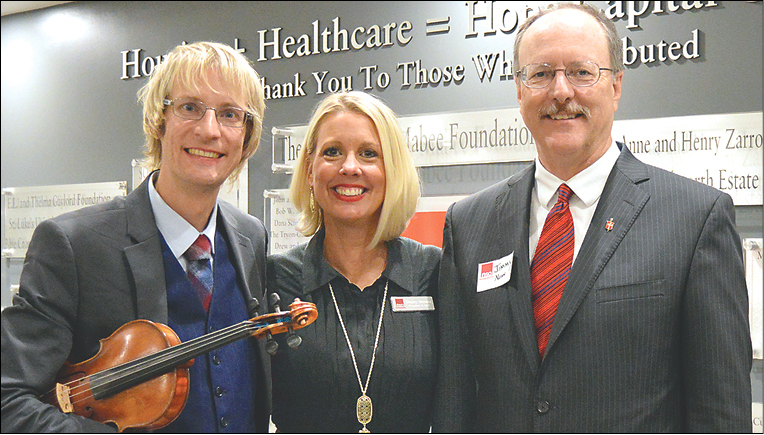 The event was sponsored by the Oklahoma United Methodist Foundation.